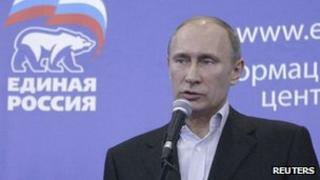 Russian Prime Minister Vladimir Putin's United Russia party has seen a sharp drop in support in parliamentary elections. Media captionPetros Efthymiou, OSCE: "The contest was slanted in favour of the ruling party"
Russia's only independent monitoring group, Golos, says it has logged 5,300 complaints alleging violations. Electoral Commission head Vladimir Churov said United Russia should have a slim majority, with 238 seats out of 450. This would mean the party had lost its current two-thirds majority which allowed it to change the constitution unchallenged. Vladimir Putin is facing a slump in popularity that he has not experienced since the Kursk submarine disaster of 2000. There are still many in Russia who do not blame him for the rampant corruption and the stagnant economy. But he is the leader of United Russia, and support for the party has fallen significantly in these Duma elections, which inevitably reflects badly on him. That said, it looks like the official results will still show United Russia gaining support from around half of those who cast valid votes, which would be regarded as a significant victory in many democracies. Mr Churov said the Communist Party was in second place with 19.2% of the vote, giving it 92 seats. A Just Russia was in third place with 13.2% and 64 seats, and the nationalist Liberal Democratic Party of Russia (LDPR) had 11.7% and 56, he added. "We have received thousands of calls from regional offices, confirming massive violations and fraud," said Communist Party deputy head Ivan Melnikov on the party website. "Throughout the day, it was like receiving reports from a war zone." The BBC's Steve Rosenberg, in Moscow, says if confirmed, the result will be a significant embarrassment to Mr Putin, three months before he is scheduled to run again for the Russian presidency. He says opposition parties are alleging widespread fraud, including the stuffing of ballot boxes and voters being offered money. Source: Electoral Commission. Results are based on 96% of the vote. Turnout was 60%. Mr Putin served as president from 2000 to 2008 but was prohibited by the constitution from running for a third consecutive term. Golos, whose monitors are not affiliated with any party, said its website suffered a cyber-attack. Ekho Moskvy, a liberal radio station, said its website had also been attacked. Golos - which means "voice" or "vote" - is funded largely by the US and EU. Prime Minister Putin has accused foreign powers of meddling in election preparations, while Duma members have questioned why a foreign-funded organisation is allowed to monitor Russian elections. Moscow police said more than 100 people were arrested at an opposition demonstration in the city centre on Sunday.